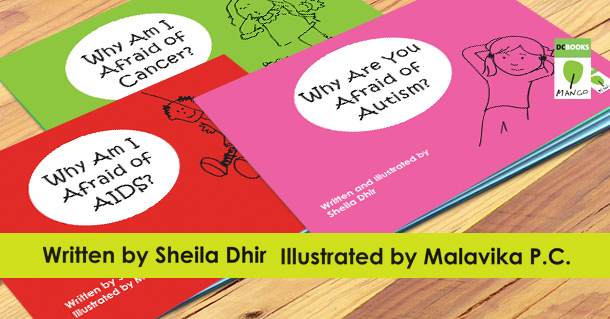 The Why Series by Shiela Dhir is an answer to questions and a reflection on contemporary sensibilities. It aims to sensitize children on topics that are considered taboo. AIDS, Autism, and Cancer may not be pleasant to the ears but needs to be discussed. With the title that doesn’t hide a cue from the reader, runs on the theme of courage and condition. The courage that children must show in accepting that they have cancer or that particular condition. The determination with which one should fight these out. One needs the confidence to fight the battle and hope to pursue confidence. The books in the series give you both. It describes the experience through the eyes of a child simple without pathos. When explaining about AIDS the author walks a thin line, between explicit frankness and coy suggestiveness. It aims to bring in the right attitude wherein one strives for acceptance where intolerance reigns, and replace fear with empathy and discrimination with compassion. The book captures three sensitive conditions powerfully and beautifully through simple visuals and direct lines.